1. Adaptation and Resilience: This research aims to build capacity for adaptation to environmental change and resilient development processes that integrate the management of risk with the pursuit of prosperity, primarily in pastoral and agro-pastoral dryland environments. This agenda includes institutional and governance dimensions, as well as specific adaptation interventions such as livestock insurance (Index Based Livestock Insurance- IBLI) and early warning systems. Partnerships with national government ministries and agencies as well as non-governmental organisations (NGOs) are critical to the impact of this research. 2. Understanding and managing the Environmental Footprint of livestock: This research aims to provide accurate and context-specific information on the environmental impacts of intensifying livestock production systems, particularly on nutrient cycles and GHG emissions. We combine empirical field measurements with modelling and spatial analysis, to provide relevant information to decision makers. The Mazingira lab is at the heart of this research. 3. Ecosystem Services and Natural Resource Management: This research aims to identify gaps, options, approaches and institutional mechanisms for enhancing the delivery of ecosystem services in livestock systems. Cost-benefit and trade-off analysis along with participatory approaches are used to promote rational resource allocation and better targeting of investments and interventions. Spatial analysis is a core tool for mapping and quantifying ecosystem services. 4. Drivers and interactions for sustainable Food Security: This research uses experimental, participatory action research, analysis and modelling approaches to identify test and evaluate livestock interventions to improve the food security status of smallholder producers. 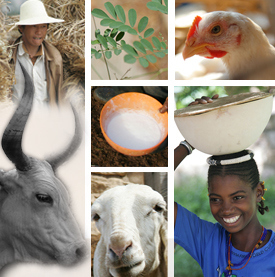 The research provides information on livestock current and future contributions to household food security under different user-defined scenarios across diverse livestock system types.